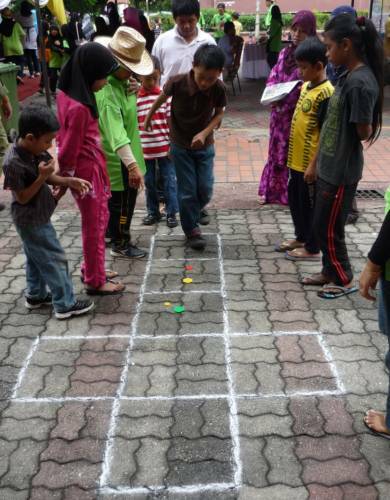 Recollect some traditional games played by the older generations born in 70s and earlier and hope our new generations can appreciate how their poor parents and grandparents spent their joyful childhood days with these games. 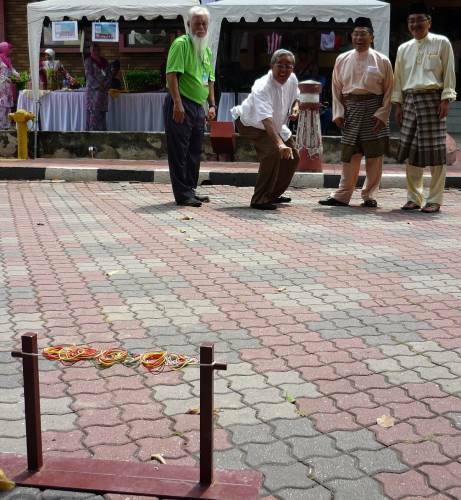 Let recall what the kampong traditional games played by Malaysian gen-X kids like me. Many games were creatively created from free natural resources. Gen-Y kids still play some of them and it’s totally strange for gen-Z born after 2000. I do not know today’s children are more lucky with the computer games or not, but I definitely will choose these free games I played if I were reborn. 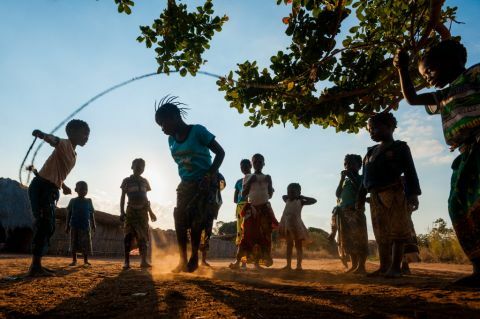 The whole new village is our playground with more than 10 kids gathered together whenever a traditional game was played. 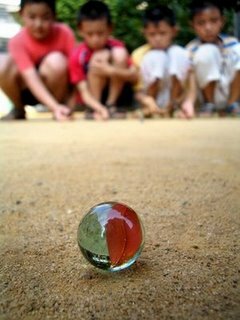 We are very poor at the time, but played these games with our peers is a fond memory and invaluable experience that no money can buy. Some games except bird trapping and outdoor swimming should be introduced to schools and kindergartens. 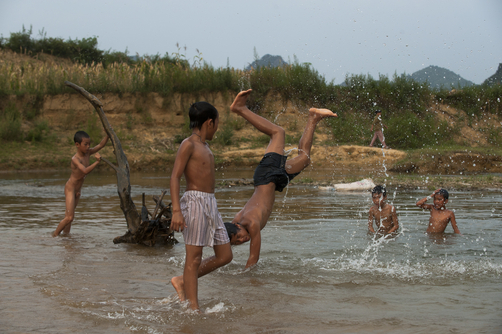 There are more than 30 traditional games I played when I was a child in a new village. Still in the process of recollecting these lost games and compiled them for the present and future generations. Share your games that have been played in your childhood days but not listed here. This game is either played on the badminton court or sandy ground. The player will jumping and kicking a ceramic chip within the rectangular box with one leg. The turn will be given to next player if the chip is moved outside the rectangular boundary and those finished the boxes will be entitled to posses a box at his/her choice. 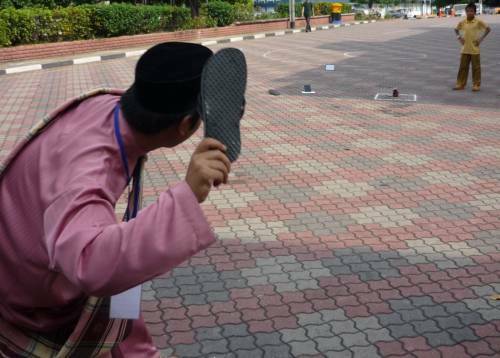 The player cannot step on the opponent’s box when he/her moved the chip. Those player occupies more boxes will be declared the winner. Usually rubber bands are used as gambling chips and located on the top of can. Those player strike the can and rubber bands falling to ground are the reward. The faster you push the wheel to the finish line is the winner. I never played this game because bicycle rim is still an expensive item for kids in 70s. Pull a string rubber band to shoot down rubber band stacks on the rubber rack. The rubber bands falling down to the ground are his/her reward. Actually, I was very good in this game and always won the game. A type of spider is called “leopard tiger” was caught from the gardens and put them in the match box for fighting. This game is similar with spiders fighting. The crickets used to be available in abundance before pesticides are widely used in the pest controls. The fishes were not bought from aquarium, we caught Malayan fighting fishes from the drainage channels in the paddy field. The fishes were reared in the empty glass cans of salted soya beans. 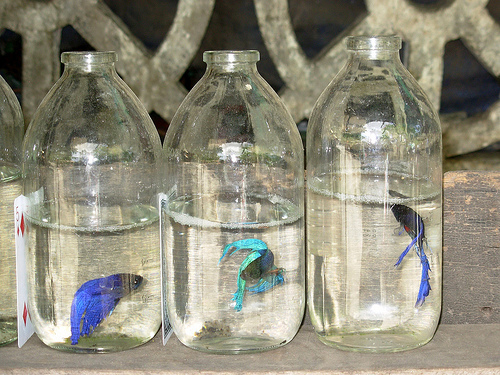 Two fishes are put in the can to see them fighting until one fish is running away, a sign of defect submission. A circle was drawn and each players contribute same amount of marbles. Each player throws a marble to hit the marbles, and marbles roll out from the circle will be his/her winning reward. Game 10: Eagle catching chicken game. 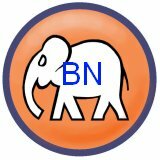 This game was played in November and December’s monsoon season during the year-end school holidays. 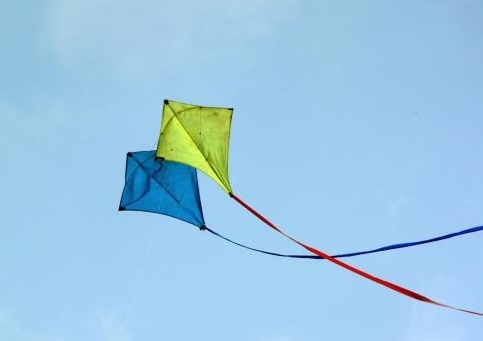 Used newspapers, bamboo sticks and sagu flour paste are used to make kites. More than hundreds kites were flying on the sky during the peak days in 70s. Game 12: Bird glue trapping and shooting with the homemade glue and string shot. 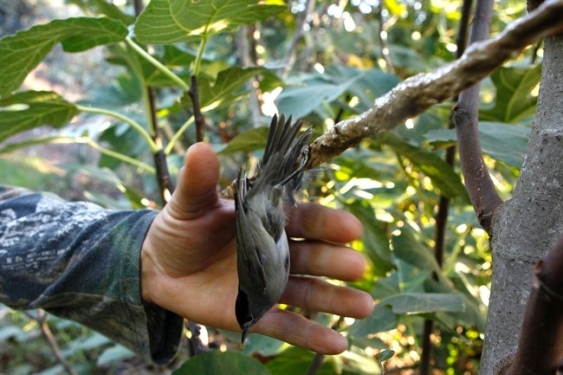 The glue is applied on the pole or branches of tree as bird trap. 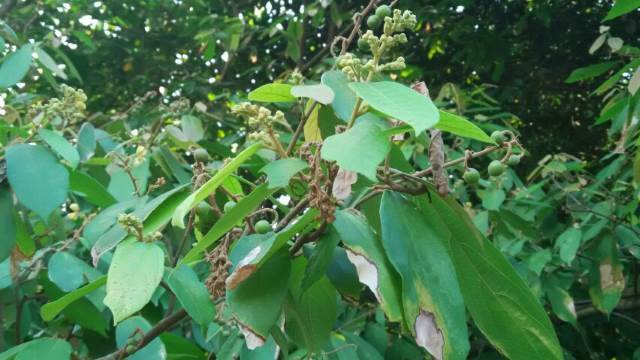 The glue is made from fluid tapped from kapok tree, rubber milk and resin by boiling them together. Game 13: Bamboo gun war game. This is similar with pin ball war game except the gun is made from a bamboo and a stick. The bullets used are seeds plucked from the “monkey tree”. The juice of the monkey tree’s seeds is a kind of indelible red ink, my playmates always got canned by their parents for indelible stains on their shirts after the war games. This is a dangerous outdoor activity not suitable for any kid, a kid from the same village in other group was drown during a swimming session. All kids in my group were safe without unwanted incident. The kid nickname is little duck and adults rested in the riverside ignored the stress calls from his peers, “little duck is in the water!”. The adults did not bother a little duck is drown until they finally realized that the little duck is actually a boy. But it was too late to find the boy in the river by the time. His ballooned corpse was recovered three days later. Another drown tragedy is my football playmate who slipped from the wooden jetty when he went to riverbank for sightseeing after the game. His second and last name pronunciation is sound like “dead road” in Mandarin. Warning: Do not try it at home! 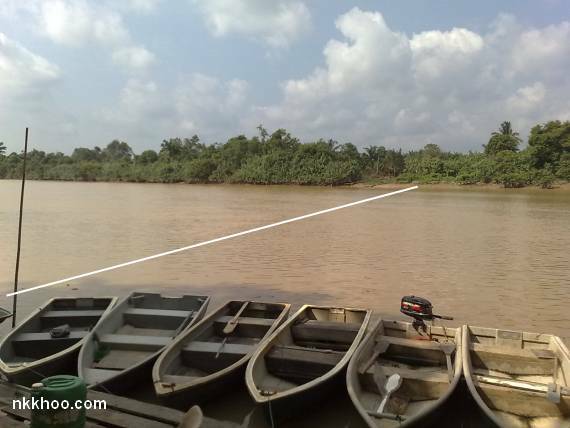 Do you believe I led a group of kids with less than 12 year old swimming cross the 100 meter wide Muar river without using floating device? That was truly crazy when I flashed back my childhood life. 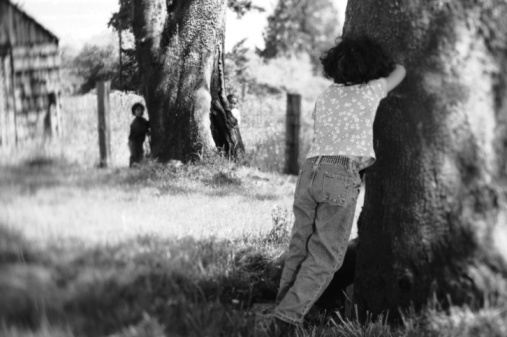 Game 15: Hide and seek game. Game 16: Attack the enemy’s fortress game. You have to touch the opponent’s fortress usually a tree or a post before you are overpowered by your enemy in their defended territory. Those team first touching the fortress will be the winner. The pre-condition for the final assault is no hostage from your side is still captured by your enemy. The hostages have to be rescued by touching them and making escape from the enemy’s territory. Game 17: Knock the stick away from a hole on the ground. Two sticks are used, one is lying on the hole in a certain angle, and you have to knock the stick out and hit the stick away before it falling to ground with another stick. The farthest the stick landed is better and be the winner. There are two games for spin, one is to see the endurance of spinning and another is to knock down the spinning spin with your spin. The rope is made from rubber bands. The players are divided into two groups to see which group is knocked out first. A few ping pong sized holes are digged out on the ground and the holes are surrounded with three wooden bars except the side facing the players. Everyone got one chance to throw ping pong ball into the hole from a predetermined distance. Those players fail to fill the hole will be the loser and the punishment received is painful. The winner will throw ping pong ball to hit the back side of loser who stands at the hole position. Game 21: Kampung styled baseball or Hainan ball game. This is quite similar with baseball played by Americans except the ball can be used to hit the running batman. Game 22: Smash the rubber seeds with palm. Game 23: Pulling palm fronds. I came across a tree nicknamed monkey seed during my cycling exercise this morning in my kampung. 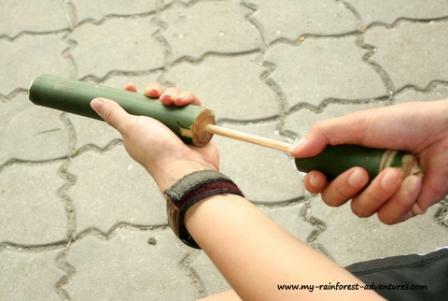 We used to pluck the seeds as live bullets for bamboo gun.